Every student knows the first question to ask when starting a writing project is “Who is my audience?” When Cynda Harris, Doctor of Audiology student in Western Michigan University’s Department of Speech, Language and Hearing Sciences, set out to write an essay, she knew the audience was not academic. In fact, it was radio station WIRX, a rock station her family listens to daily from their home near Western’s Southwest Campus. The purpose of the essay? To win a contest sponsored by WIRX, “Get Lit This Christmas” that would bring a professional light installation crew to her parents’ home to decorate for the holidays. Harris knew the radio station was not looking for an academic essay, so she wrote the following heart-felt letter, sent it off and thought no more about it. Imagine her surprise when, a few weeks later, the phone rang while she was taking a well-deserved nap between studying for finals, working her internship, volunteering with ROTC, and taking classes. 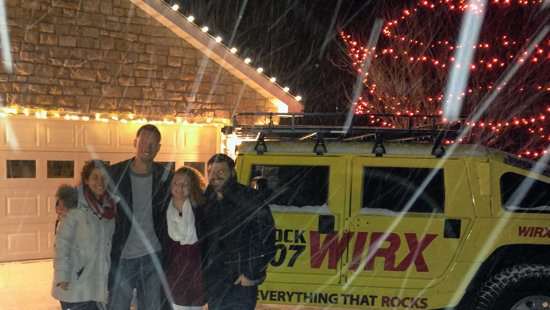 The radio shock-jock’s voice blared in her ear, causing the type of damage her audiology program is educating her to treat (for audio of this conversation, click here: http://www.wirx.com/get-lit-this-christmas/).Harris got her wish; her parents’ home was covered in lights, and the radio station came out for a big lighting ceremony. But nothing made up for the fact that her brother wasn’t home for Christmas because he’s serving in the US military in South Korea. After she finishes her program, Harris plans to enter the military as well and serve as an audiologist. Only two of all graduating audiologists in the entire United States will be chosen for a Navy externship each year. The externship, which is the last thing she will need to complete her Au.D., would last from summer 2017 to summer 2018 and takes place at a Navy base either in the US or around the world, working in a Navy clinic or hospital. After graduation from WMU and getting her license to practice audiology, Ms. Harris has her sights set on a military training school which would lead to a career practicing as a military audiologist. Her commitment is palpable. In her own words, “The men and women who fight would willingly give up life and limb to protect their loved ones. I will only be happy if they are safe.” While audiologists are expected to be competent in every aspect of the hearing field, according to Harris, military audiologists differ from audiology specialist practices in the United States. These typically focus on one type of audiology, military audiologists must be proficient in every category of audiology: hearing loss from trauma, infection, or medical condition, and adult or pediatric audiology. If and when she decides to establish or join a practice back home, she knows she can handle any patient situation she encounters. While an undergraduate, she tutored Japanese students and traveled to Japan. Her love for all things Japanese has fostered her hopes to eventually be stationed on a military base in Japan. She double majored in Japanese Language and Culture and Pre-Audiology at Ball State University. A recipient of the Whitinger Scholarship, Ball State most prestigious scholarship, Harris was able to double major and received her bachelor’s degree in four years. As an audiologist entering the military she would be a commissioned officer, so she needs to know about each branch of the military. To that end, Harris volunteered for ROTC here on Western’s campus during fall 2016. Her busy schedule also includes working as Graduate Ambassador in the Graduate College at Western Michigan University for fall 2016 and spring 2017, where she acts as a liaison between students, faculty and staff in the College of Health and Human Services and the Graduate College. Harris is as determined now as she was while an undergraduate at Ball State. The Doctor of Audiology degree is a four-year post baccalaureate professional degree which prepares its graduates to provide high quality services and leadership in the field of audiology. Audiologists are health-care professionals who specialize in identifying, diagnosing, treating and monitoring disorders of the auditory system, which involves both the inner and outer ear. The degree program is rigorous. Currently 23 students are enrolled in some stage of the program, which involves completing all requirements of the American Speech-Language-Hearing Association’s Certificate of Clinical Competence and/or state licensure. This means a four-year schedule packed with coursework, clinical practice, professional field experience, outcomes-based formative assessment and independent scholarly research. While pursuing this rigorous schedule, Harris also performs as a Graduate Ambassador, works at PetSmart, volunteers with ROTC, and sometimes babysits for her six-year old brother. On top of all that, she takes time to write and submit winning essays designed to cheer up her parents. We’d say that’s pretty impressive. This entry was posted in Graduate Student Achievement by JamesKison. Bookmark the permalink.